A holiday loan can help you cover the financial burden of the holiday season. Whether you need the cash to travel, purchase gifts or cover for a decrease in income when you take time off, holiday loans can provide the assistance you require. Unfortunately, if you have bad credit, you will have a harder time getting any loan, particularly a personal loan, like a holiday loan. 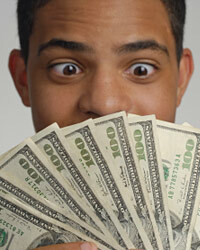 There are some strategies you can use to attempt to gain financing despite your poor credit. Secured loans use collateral as assurance you will not default. This is particularly beneficial for a bad credit borrower. A good credit score is one way to promise a lender you will not default on a loan. Borrowers who routinely pay their debts exemplify the fact they prioritize making payments over other expenses. They show lenders they value their credit score enough to consistently pay loans, regardless of circumstances. If you do not have this type of history, you will need to show a lender you value the loan in another way. Using collateral is one way to show this. You can use any asset as collateral, including: auto titles, home equity, jewelry and valuables, savings accounts and stock certificates. Using collateral will reduce the expense of the loan even with a bad credit score. Many people forget that credit cards represent a loan. The credit card company issues a card with a given limit. The borrower gets to spend this money and pay it back on a flexible schedule. As the borrower makes payments against the balance on the card, the limit is restored to its original levels. This means the borrower has essentially unlimited access to credit as long as the balance is periodically paid off on a credit card. During the holidays, you can use a credit card to cover expenses in the short run. Even a card with a $1,000 limit can be used again and again to generate unlimited access to purchasing. You will have to pay down the balance, but this can be done in small, periodic payments. For example, you can book a $700 trip for a family of three using the card. Then, you can pay $100 a week for 5 weeks, and you will find you have an additional $800 of credit to spend on gifts. If you are truly desperate for the loan and cannot find another resource, a pay-in-full option may present you with an opportunity to find financing. With this type of loan, you will not have a monthly payment schedule. Instead, you will agree to pay the entire principal and interest on the loan at one time in the near future. Pay day loans are an example of pay-in-full loans. These loans carry a high amount of risk because you will default if you cannot pay the full amount the moment the loan is due. It is better to elect more flexible options, but this is an option of last resort if needed.